Despite missing 19 games with a broken hand, Rangers alternate captain Ryan Callahan didn't miss a beat upon his return. He had a game-tying goal and went right back to his hard-hitting style against Pittsburgh's Kris Letang and his teammates. Ryan Callahan and Brandon Dubinsky both made their long-awaited returns to the Rangers’ lineup on Tuesday night -- and both players found their way on to the scoresheet -- but the Blueshirts were only able to secure one of a possible two points, dropping a 4-3 decision to the Pittsburgh Penguins in a game decided by an overtime shootout. Pittsburgh’s Dustin Jeffrey scored the only goal of the shootout, which lasted seven rounds, beating Henrik Lundqvist with a hard forehand shot. Pens goalie Marc-Andre Fleury then denied Marian Gaborik to hand the Rangers a defeat in their first game back after the All Star break. Callahan, who logged more than 21 minutes of ice-time in playing for the first time since breaking his hand in Pittsburgh back on Dec. 15, directly helped the Rangers earn an important point in the standings on Tuesday by scoring the tying goal late in the second period. He also provided the team a major boost with a game-high seven hits and four shots on goal after a 19-game absence from the lineup. Dubinsky, who had missed five games due to a stress fracture in his left leg, played more than 23 minutes and earned an assist on a goal scored by Artem Anisimov in the second period. He also delivered four hits and won 15 of his 19 faceoffs -- a 79 percent success rate. 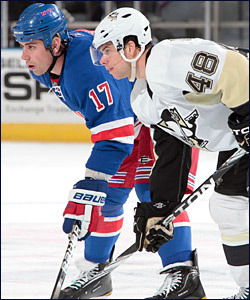 Brandon Dubinsky lines up for a faceoff against Pittsburgh's Tyler Kennedy. Dubinsky, the Blueshirts' top scorer, was also back in the lineup on Tuesday after recovering from a stress fracture in his leg. Trailing 3-2 late in the second period, the Rangers were awarded a five-minute power play when Pittsburgh’s Jordan Staal was handed a match penalty for attempting to injure Brandon Prust. After being stymied for much of the power play, Callahan --- right out of a movie script -- scored a power play goal with 12.5 seconds left in the period to tie the game. Stationed just to the side of Fleury, Callahan deflected Michael Del Zotto’s slap shot from the right point into the back of the net for his 11th goal of the season, and his first -- largely due to his long injury-absence -- since Dec. 12. The Rangers’ managed just three shots on goal during the five-minute major, and Callahan had two of them. Pittsburgh’s top-ranked penalty killing unit frustrated the Rangers at every turn, although Fleury did have to make one terrific stop on Brian Boyle in front before Callahan scored his clutch goal which sent to the game into the third period tied 3-3. Staal -- the younger brother of Rangers’ All Star defenseman Marc Staal -- was ejected from the game after he skated into a scrum and sucker-punched Prust with his glove still on after the rugged Blueshirts winger had tried to move a pile of players log jammed at the Penguins’ blueline with a hard check. Prust -- who earlier in the game had scored a goal and also fought Pittsburgh’s Deryk Engelland---dropped to the ice as Staal’s left hand caught him in the jaw. Prust was slow to leave the ice, with the aid of team trainer Jim Ramsay, as Staal was escorted to the dressing room amidst a shower of boos from the Garden Faithful. 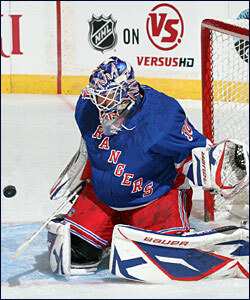 Rangers goaltender Henrik Lundqvist makes one of his 23 saves over the 65 minutes of regulation and overtime on Tuesday. Lundqvist stopped an additional six shooters in the overtime shootout. The Rangers had scored the only goal of the first period when Prust cashed in on a loose puck in Fleury’s crease at 3:52. Pittsburgh’s defensemen seemingly lost sight of Prust when he circled behind the net as Boyle and Wojtek Wolski worked the puck out into the slot. Prust had a wide-open cage to sweep his eighth goal of the season into. Anisimov provided the Rangers a two-goal lead just 1:41 into the second period batting the puck past Fleury after Dubinsky had swatted a rebound of Gaborik’s original shot over to him at the far post. Gaborik -- following the heed of Tortorella to use his world-class speed to generate scoring chances -- made the whole play take shape by bursting up right wing, leaving Pittsburgh skaters in his wake, before cutting to the middle and ripping a shot into the chest of Fleury. Anisimov was then in the right place at the right time to score his 11th goal. The Penguins, playing without the injured Sidney Crosby and Evgeni Malkin, answered back by scoring three goals in less than nine minutes to grab a 3-2 lead by the 14:12 mark of the middle period. Jeffrey scored his third at 5:30; Michael Rupp converted a rebound for his fifth goal at 10:36; and Chris Kunitz provided Pittsburgh its first lead with his 17th. Callahan’s goal late in that same period provided the Rangers a crucial point in the standings, but Fleury’s sharp goaltending -- including his 11 saves in the third period when his own team managed just three against Lundqvist -- kept the Rangers from securing both points. The Rangers return to action on Thursday night when they host the Devils at The Garden.